Each area of Italy has its specialties - staples - that they're known for. So we've created this "Tour of Italy" Italian gift basket that's comprised solely of those famous tastes. With rich pasta crafted in Puglia, tomato sauce originating from Rome, and gourmet pistachio biscotti for dessert, this basket unites the best Italian tastes in a beautiful gift that's nothing shy of perfetto. 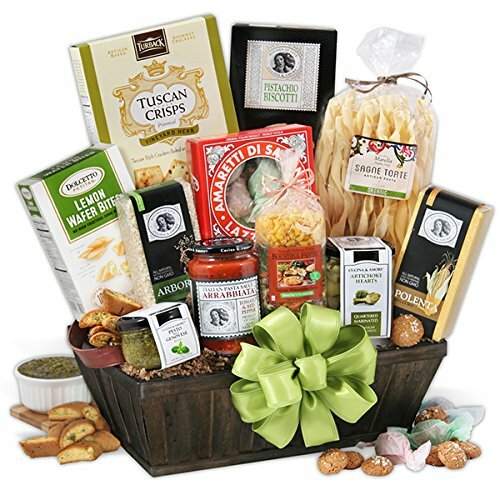 This stunning gift unites the best Italian tastes in a beautiful woven gift basket, exclusively from GourmetGiftBaskets.com! Gourmet foods include imported organic artisan pasta, authentic arrabbiata pasta sauce, arborio rice, herbed Tuscan crackers, marinated artichoke hearts, Tuscan minestrone soup, polenta, basil pesto, lemon wafer bites, Italian apricot cookies, and pistachio biscotti!